Irish and other peacekeepers serving in south Lebanon are target for militant jihadists, according to the commander of the UN force there. 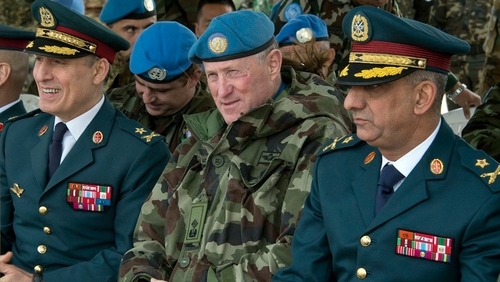 Speaking to RTÉ's This Week programme, UNIFIL Force Commander Major General Michael Beary said: "Probably the biggest concern for me is the jihadist threat and any threat that would develop with regard to UNIFIL. "Definitely, we would be a target for that kind of activity because a lot of the member states who are contributing to UNIFIL are part of the global coalition against ISIS, so it is something I have to be very careful with." More than 300 Irish soldiers currently serve in Lebanon as part of the international force. The loss of territory by extremist Sunni groups in Syria and Iraq has given rise to concerns that they could seek to escape to Lebanon and combine with existing groups based in the Palestinian refugee camps. "Our indications would certainly be that, with the retrenchment of ISIS and such groups as Nusra in Syria and in Iraq, that there is the possibility that they will seek to exit through Lebanon," said Maj General Beary. "We do know, for example, that we have Sunnite jihadists within the body of some of the Palestinian refugee camps, so we have to be extremely careful with that to ensure that it doesn't affect the work of UNIFIL in south Lebanon," he added. The fighting on Lebanon's borders has also affected the deployment of Lebanon's own armed forces (LAF) in the south of the country. Under UN Resolution 1701, passed in the aftermath of the 2006 war with Israel, the UNIFIL forces are to help the LAF become the sole armed group in the southern area bordering Israel, where Hezbollah Shia militias are active. Maj Gen Beary said the LAF is currently "stretched" and unable to deploy in the area in sufficient numbers: "The Lebanese Armed Forces are extremely stretched. They have significant security challenges along the northern border and the eastern border with Syria. "In fact, that extends to actually fighting in the Arsal region on the eastern border. That basically means that a lot of resources are basically drawn away from south Lebanon and our task in 1701 is to work closely with the LAF to extend their authority right up to the Blue Line and in effect, that has worked quite well, but unfortunately we don't have the numbers we would like because of the security challenges the country faces elsewhere." Maj Gen Beary also supported the UN position that views expressed recently by Lebanese President Michel Aoun are not in line to UN Security Council Resolution 1701. Speaking recently in Cairo, Mr Aoun said that he would be open for the Shia militant group Hezbollah playing a greater role in defending Lebanon. "Hezbollah weapons are not contradictory to the state, but are an essential part in defending our country,” Mr Aoun told an audience in a speech. The UN's special co-ordinator for Lebanon, Sigrid Kaag expressed concern about Mr Aoun’s remarks in a tweet. "Recalling SCR [Security Council Resolution] 1701 vital 4 Lebanon's stability-security. Resolution calls 4 disarmament all armed groups. No arms outside control of state", she tweeted. Asked about Mr Aoun's proposal for Hezbollah to play a greater role in Lebanon's defence, Maj Gen Beary said: "Certainly, it is in contravention of 1701. However, my task is to deal with the State institutions. I deal directly with the LAF and with the LAF intelligence and they are the institutions of the state, so I deal directly to them and to the Lebanese government, including to the Prime Minister." Maj Gen Beary is the first Irishman to command the force in over 30 years. He said that Irish peacekeepers work in a "very sensitive" part of the UN area and "make a very valuable contribution". He said the Lebanese government recognises the contribution to peace in south Lebanon made by Irish UN units, who have lost 47 soldiers in the area.